Greg leads a father and daughter from California into the wilds of Montana's Glacier National Park for their first backpacking experience. Their destination was the totally unique Sperry Chalet built high in a remote section of the Rocky Mountains. Greg meets Kevin and Sara Durbin at the Sperry Chalet trailhead to begin the tough, seven mile climb to one of the most amazing places in Glacier National Park. 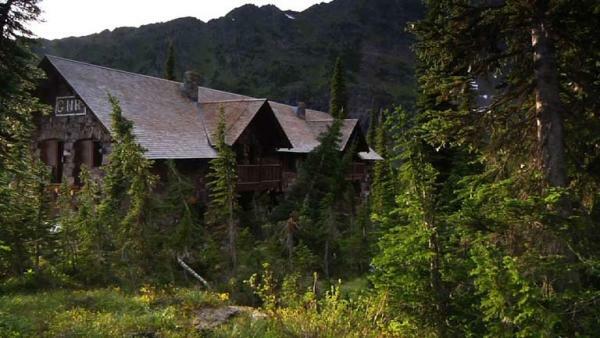 After the last part of the hike took its toll on Kevin and Sara, the team arrives at the Sperry Chalet for one of the most unique back country experiences in America. Morning over Glacier National Park brought clear skies, lots of sunshine and a short hike to an incredible view of the Rocky Mountains. Greg, Sara and Kevin make a few 'friends' along the way. Kevin and Sara share their thoughts of hiking with Greg and the Motion crew in one of the most stunning places on earth. Are you ready to get into the great outdoors and explore the beauty of America? This is your chance to sign up and be selected to go on the road with Motion! Click here for more information. Glacier National Park is considered the crown jewel of the entire park system. Explore the beauty in these photos that Greg took along his journey.